Little Gate has a big tree branch purposefully secured in a pot with the intentions of reinventing its significance. It has been a thankful tree, a Mardi Gras tree, and a holiday tree decorated with beads that children have strung on pipe cleaners. Recently, the tree was brought outside along with fall color paint with the intention of having the children paint the branches. What happened was extraordinary! The teachers noticed some children were painting with soft, slow strokes and others began to slap the paint brush on top of the previously layered paint strokes. Using these instincts and natural desires stemming from the children, the teachers turned this into a lesson about Jackson Pollock. 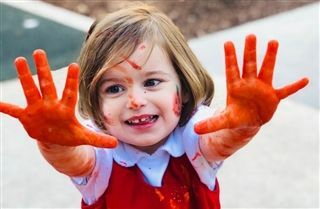 Not only were they painting - they were noticing the movements of the branches, the splatters of the paint on the branches and on themselves, and the reactions and comments of those standing around them. We love when our plan makes an unexpected turn!